Well that didn’t take long. Not even 24 hours after the iPhone 4 became available online for pre-order, it is completely sold out. Earlier today, reports had AT&T being out of the device. Now the Apple Online Store is out of them too. They’ll still let you pre-order one, but you won’t be getting it on June 24 (launch day). 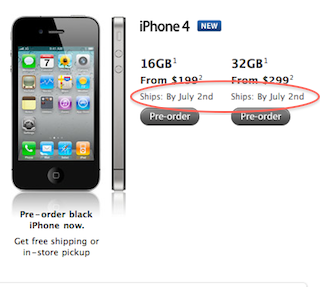 Instead, Apple is saying the next batch of phones will ship by July 2. The fact that Apple blew through their entire first run of iPhone 4s in something like 20 hours is impressive any way you slice it. But it also begs the question: how fast would the device have sold out if the pre-order system actually worked today? I don’t think it’s a stretch to think the iPhone might have been gone twice as fast. As we covered last night, when the iPhone 4 first went up for pre-order on Apple’s website, there were massive failures in the system that prevented people from completing their orders. Those failures carried into this morning and even this afternoon and people still were having difficulty ordering the phone. Some were able to order it from AT&T’s site, others weren’t. Some were able to order from the new iPhone Apple Store app, others weren’t. The system seems to be running smoothly now, but again, if you place your order on Apple’s site, it will state that you phone will ship after launch. The July 2 date currently listed is just 8 days after the current June 24 launch — but that’s also the ship date, so it could arrive a few days after that. Right now, if you’re hoping for an iPhone 4 before July, your best bet may be to hope Apple releases the elusive white iPhone 4 (which didn’t go up for pre-sale last night) into the wild before then. Or hope that Apple saved a few to sell in stores to those that didn’t pre-order.